Ok this may seem like a simple question but for the life of me I can't figure out what I need to do to set this up. We have a couple of Lynx Expresses that are active weird on wireless so figured we would try to use the DMX out on the PiCap. I just have not been able to figure out how to set it up on FPP v2.5 to do so. So any pointers would be great. Thanks, that was exactly what I needed. Not sure why I wasn’t able to find it searching the forums. One more question under port do I select anything? The options are ttyAMA0 and ttyS0, what is the difference if any? The reason I ask is I can't seem to get it to work with either of them. With the terminate jumper on or off. Included photos below. All of my AC Lights are in universe 1, so absolute channels 1-512. I haven't tried this (yet) but someone said that you may need to create an entry in Channel Outputs E1.31/Artnet for the universe you are using. Supposedly to create buffer space for it. I had this problem a week ago and just used a USB dongle instead. If it works, come back and say so! Good luck. And like magic once the EX/RX was gone it started working. So still working on my endeavor to eliminate my Lynx Ether Dongle and Flaky/Old Lynx TX/RX. 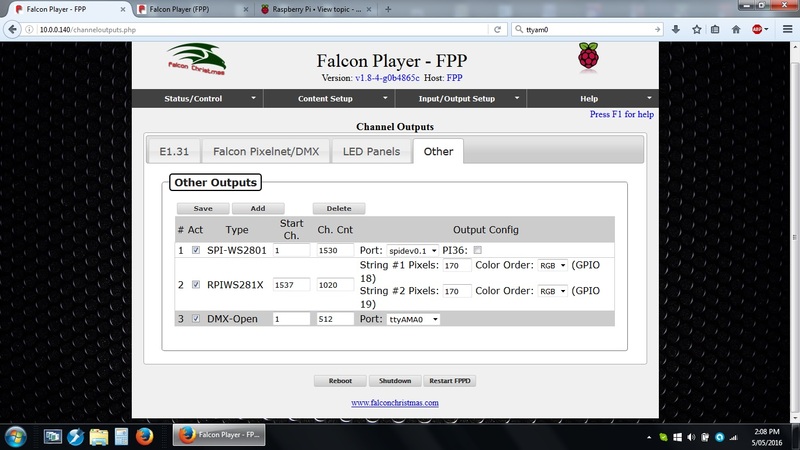 I have easily converted 10 of the houses to using the Falcon PiCap DMX out with the settings that are shown above. The last house however instead of the Falcon PiCap it is using a Hanson RPI-28D PiCap. The Hanson Cap works great for pixels but I am not able to get DMX to come out of the DMX port. I have tried both ports shown in the other outputs and neither seem to work. So the only thing I can think of is either a bad RS485 chip or the wiring is different between the normal DMX Open and what the Hanson is putting out. I'll try swapping the RS485 tomorrow, too close to show time to try and deal with it now. But was hoping someone might have some ideas. I did not remove the Terminate jumper when I first tried. Honestly, didn't even see the thing. That application is still running using an ENTEC USB DMX-Pro dongle. I won't see it again until after New Years to test. I have zero idea about the Hanson board. I am running 4 Lynx Express wireless from my Pi. What I did find is the plug in wireless modular on the Express board has to be REMOVED it will not work. So I put one of the Tx/Rx units on the outside of my case & ran a cat 5 to the board. Then connect the Lynx Dongle to one of the USB connections on the Pi. Run a cat 5 from the dongle to the Lynx wireless transmitter, has been working without a flaw for a month now. Yeah we are currently doing the scenario you describe. The problem we are facing is that our TX/RX has become really unstable and will occasionally work for some of our Lynx Expresses but not for all of them. And since we added Pis and PiCaps to all of the houses there we figured we would use them to eliminate the TX/RX completely. Removing a possible point of failure from the show. And we have successfully done this with all of the houses but one. And that is because the PiCap is slightly different. Yeah not sure why but I had to remove that terminate jumper otherwise It wouldn't work. I even forgot on one of the house and it wouldn't work and we were sitting there for half an hour scratching our heads, checking wires and everything until someone looked at the Pi Cap and removed the terminate jumper and presto everything worked. As to the Hanson it is an even bigger head scratcher. In theory according to everything we can find it should just work, but of course it doesn't. We went ahead and ordered another Falcon PiCap in case we can't figure it out, and will use the Hanson for just pixels next year. Have you check the box for Always transmit channel data: ? If I use the DMX from a port on my F16v3, it "always transmits"
When I was getting DMX from my old FPD board, that was required to keep my DMX floods from going into Test Mode. So the Falcon PiCaps have Always Transmit turned off, as did the Hanson. I tried turning it on and tested again with no luck. I then swapped the RS485 chip in the Hanson with a know working chip and tried with both always transmit on and off with no luck. Is there a way to test to see if data is coming down the ethernet cable? Maybe it is just coming out different wires then the normal (White Orange/Orange for data on pins 1 and 2 is the correct format if I remember right). I have tried 3 different cables that work in other locations just to make sure it wasn't the cable I was using. If it is the wiring scheme making a dongle is easy just don't know how to test where data is coming down. If you sacrificed a short CAT5 cable end so that all 8 wires were exposed, you could check the outputs for voltage to see if there is anything on wires other than Orange-White/Orange (1 and 2). Another check would be visibly tracing the circuit board connections from the RS485 chip to the RJ45 jack.